An integrated package of products, systems, and solutions from the technology group Wärtsilä will enable a new Wasaline RoPax ferry to be among the world’s most efficient and environmentally sustainable ships. 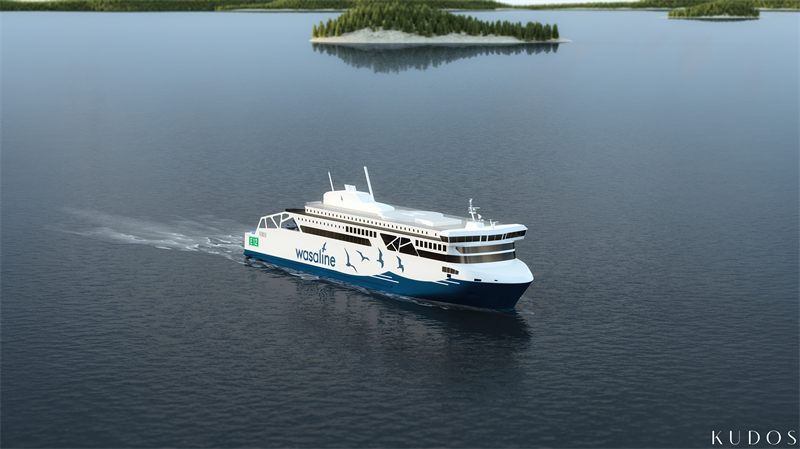 NLC Ferry operates the Wasaline service between Vaasa, Finland and Umeå, Sweden, and the new ferry, featuring state-of-the-art Wärtsilä technology, is scheduled for delivery in May 2021. It is being built by Rauma Marine Constructions in Finland. The orders with Wärtsilä were booked in March 2019. Among the ship’s outstanding features will be its hybrid propulsion solution. This will incorporate four highly efficient Wärtsilä 31DF dual-fuel engines capable of operating on liquefied natural gas (LNG) and biogas. The diesel version of the Wärtsilä 31 has been recognised by Guinness World Records as being the world’s most efficient 4-stroke diesel engine. Wärtsilä will also supply the LNG storage, supply and control systems, as well as the thrusters, catalysators, controls, and the integrated electrical and automation systems. The latter will incorporate an energy and power management system to optimise the use and operation of the hybrid power solution. The combination of the Wärtsilä 31DF engines, hybrid propulsion, and LNG and BioLNG fuel will establish this ferry as a benchmark in efficiency and sustainability. The CO2 emissions, for example, will be reduced by more than 50 percent compared to Wasaline’s current ferry serving this route. “We are extremely excited about our new ferry. It will be truly world-class with the latest and most advanced technologies, and for this we appreciate the support that Wärtsilä has provided. We know and trust their products. For example, our existing ship is powered by a Wärtsilä Vasa 32 engine that has already accumulated an incredible 200,000 hours of operation. This outstanding reliability is an example of why we have selected Wärtsilä again,” says Peter Ståhlberg CEO at Wasaline. “Shipbuilding in Rauma has a long-standing history dating back some 600 years. During that time all kinds of vessels have been delivered, but never has there been a ship as technologically advanced as this new Wasaline ferry. The efficiency level is very high, and the hybrid technology employed results in minimal exhaust emissions. We introduced first Wärtsilä 31 engines in use with our first newbuilding MS Hammershus, therefore it is exciting to be able to install the first LNG-powered Wärtsilä 31 engines also to our next newbuilding. At the end we will be proud to be the ones building this ship,” says Jyrki Heinimaa, CEO, Rauma Marine Constructions.